Rob Ratcliff was the Content and Community Manager of IFSEC Global.com. He is a self-confessed everyman in the world of security and fire, keen to learn from the global community of experts who have been a part of IFSEC for 40 years now. A challenge to the security industry and to video surveillance installers was laid down by the Metropolitan Police yesterday after it was revealed that only one arrest made in connection with the London riots was a result of facial recognition technology. Almost 5,000 people have now been arrested in connection with the Met’s investigation into the August 2011 riots, codenamed Operation Withern. Of those, around 4,000 were a direct result of evidence from CCTV equipment, marking it an incredible success story for the technology. But at a conference held at New Scotland Yard yesterday, DCI Mick Neville of the Central Forensic Image Team revealed that only one of these identifications was made using automatic facial recognition technology. The remainder were all made by officers who together made up one of the largest investigation teams ever assembled by the force, numbering 633 at its height. Of the 4,962 arrests made, 3,145 people were charged, with an 81 percent conviction rate for offences carried out between 6-9 August 2011. Many of the identifications were made by so-called “super-recognizers” — people who are exceptionally talented at recalling faces. The problem with facial recognition technology, according to DCI Neville, is invariably linked to the position of cameras in high-up places. Evidently, this type of position is crucial in recording the overall scene of a location and in viewing any criminal activity. But officers suggested that adding a camera that was positioned at eye level — perhaps at the entry point of a location — would enable much clearer images of faces to be recorded, something that would improve the ability of facial recognition technology to be an effective tool. “Facial recognition needs face-level cameras,” Neville added. He then challenged delegates in the room — made up of installers, council CCTV control room managers, and other interested parties — to make this happen. PC Pat Horgan, who was in charge of Operation Withern’s viewing teams, added to the challenge by calling for better CCTV images in general. The range in quality of the footage taken from private CCTV cameras “varied enormously,” and Horgan wants to see HD images make up a bigger proportion of the images used. He added that perhaps insurance companies could offer reductions in premiums to those businesses that have a good high-definition surveillance system. Let us know what you think about facial recognition by voting in our latest poll. So, the camera needs to be up to the task as well, is that what you mean? In essence, yes. The camera can be HD quality, but there are facial recognition programs/software available that actually do the job that is required. I think that putting megapixel cameras in more convenient places partially sorts the issue. Perhaps it will be enough, but a crowd full of people may be too difficult for the camera alone to detect faces. I’m surprised with caps/ hoods and camera positioning as previously mentioned, that facial recognition delivered at all. I think positioning of camera is one of the most important aspect need to be taken care of. I believe that there are definitely advantages and disadvantages of whatever position we are taking as far as siting of camera is concerned. The camera must be high resolution with enough optical zoom capable might be few of the choices we need to think upon. But I believe the purpose for which it is to be placed will drive its positioning. Although I agree with your comment, would that particular camera then be installed knowing it may not capture people’s faces? 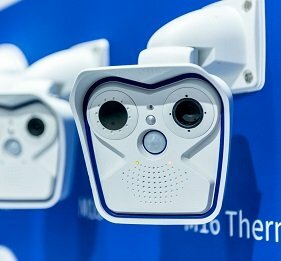 Cameras on that scale will be put up with a specification behind it, and if they want facial recognition then a camera “positioned better” may not fulfil that brief. Well in that case perhaps a user should be looking again at their operational requirement and see how they can better match it to their specification. What your budget will allow will ultimately guide you, right? I wonder about the business use of facial recognition. Surely there would be data protection/ privacy implications here? would banks need to declare they have a camera that will be checking your face for identification purposes when a prospective client enters the building? That is a good question, I would have to guess that it would depend upon the way they handle the recognition like say if they keep a picture of your face on file then yeah there should be some privacy notification out there but if they are just identifying a pattern based off of your features through some type of algorithm then maybe not. It was impressive that they were able to make this arrest. I’m intrigued by these “super-recognisers”. sound like there’s huge potential in using these skills. @ JonathanL, your guess seems probable. Moreover, if identifying the person by comparing his/her image with DVLA database is the only reason for recording the face picture, there may not be any need of declaring it explicitly. Because once they have verified the identity of the person, they don’t need the picture anymore. They will have to declare it otherwise of course. I think you’re right that such face-on cameras are good practice full stop for getting a better image of a person. Who needs an image of the top of someone’s hood when you could get a straight-on picture of their face. As you say, such images are useful for human operators as well as the computers! I think that although most would agree that angle is useful it’s often hard to implement and when you’re being cost conscious that camera covers such a small area that it’s often the first view chopped when trying to stay within budget. Right, SafenSane, angle definitely matters. It then follows that camera installation and placement matters, because how you install it affects the picture that it captures. In such a case, surveillance is likely to work well only with a vigilant member of staff on duty. And no matter how vigilant one is, you can’t pay full attention 100% of the time. Having been into places like this at 2AM, I have to agree. This is usually when a store clerk is stocking shelves or other tasks that can’t be done during the busiest hours. I’ve also seen some places where even if the clerk was watching my every move the lay out of the store makes it impossible for them to see a customer in some areas. Even the best places around have blind spots. You have to do a cost-balance with retail loss prevention right? How much merchandise can you afford to have stolen versus investment in security? You’re right, it can be very site specific. Depending on ceiling height, width of the corridor, etc., sometimes you can get very good coverage with a 2-3MP camera and a good wide angle view. There’s always data protection to be aware of. I’m not sure what the specific (if there are any) rules are around facial recognition technology, but I would imagine it’s similar to general surveillance requirements: ensure that you store the image securely, with controlled access only to approved people, and that you state how long and for what purpose the image will be stored. One thing is plain enough that it is actually the positioning and imaging quality of the surveillance that is in question and not the Facial Recognition Technology. But I personally think that facial recognition algorithms may also be improved to better match the distant facial features or by zooming them in without breaking the pixels.